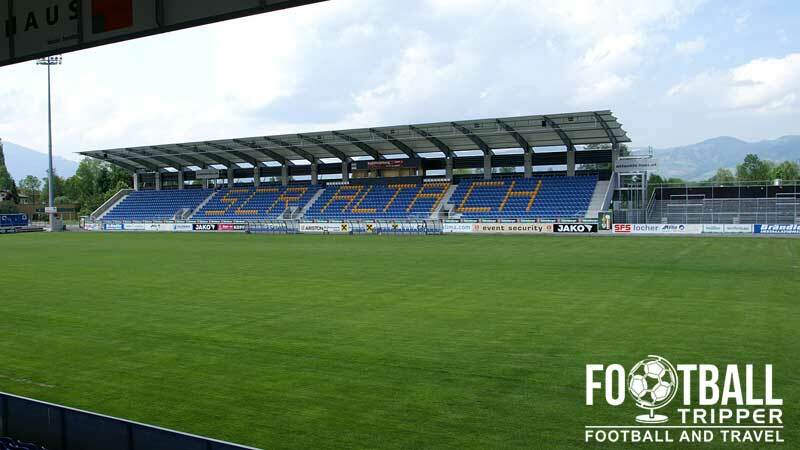 Stadion Schnabelholz is the home ground of Austrian Football Team SC Rheindorf Altach and it is currently known as Cashpoint SC Rheindorf Arena for sponsorship reasons, after the Austrian Sports Betting Company. Built in 1990, the arena located in Altach has a modest capacity of 8,900. The Schnabelholz Stadion first opened on the 1st of June 1990, replacing the former ground Sportplatz (Sports field) Riedle which had acted as the club’s home for over 40 years having first come to be associated with the SC Rheindorf in 1950. The former stadium was not totally abandoned however, and has since been used to host reserve fixtures involving the youth team amongst other training purposes. With Rheindorf Altach competing in the third division “Regionalliga West” back in 1986 and only entering Austria’s top flight competition in the 2006/2007 season after beating SC Austria Lusteneau in their penultimate fixture, it is perhaps understandable that the stadium’s facilities and capacity has developed slowly over the course of 25 years to bring it up to its current ability to host 8,500 supporters. If you were to trace the stadium developments over the years, it is clear that the promotion to the Austrian First League (the second division) in 2004 resulted in the growth of SC Rheindorf’s ambition with VIP facilities and new floodlights added, marking the first signs of investment since 1998 when the main stand became completely covered, with the addition of the roof. 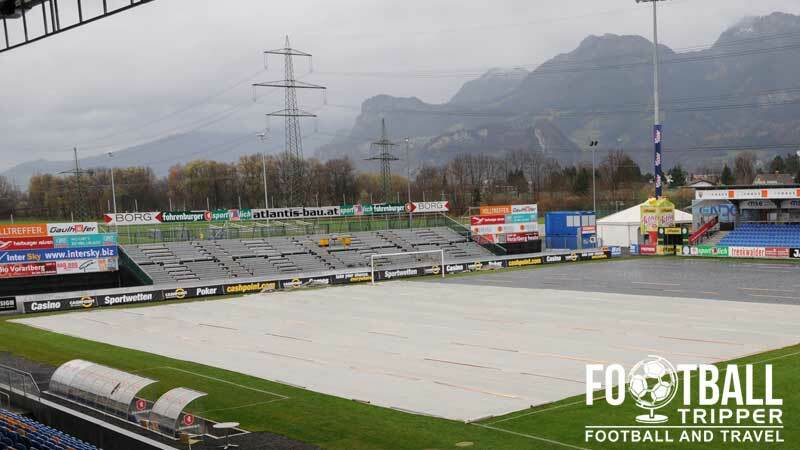 Promotion to the Bundesliga saw a record attendance of 8,900 set when SK Rapid Wien visited but this wasn’t to be achieved until the club complied with regulations which ensured that all seating must be covered. The club responded to the League’s request in 2008 by not only building more roof coverage but also by constructing a new grandstand which resulted in an additional 1,800 seats. This expansion was partially financed by Altach SCR’s decision to sell the naming rights of the stadium to the main sponsors, with the ground officially becoming the Cashpoint-Arena in June 2007. Cashpoint Arena is comprised of the four stands: North, East, South and West. Away fans are housed within one section of the north stand (Sektor Nord) which is shared with home supporters. 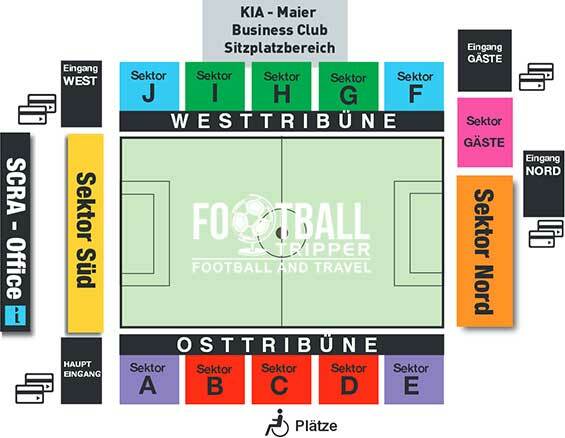 Entrance for visiting supporters (Eingang Gaste) is predictably located within the north-west corner of the ground. SC Rheindorf Altach operate a fan shop at Cashpoint Arena in addition to an online store which also sells official merchandise. The club shop is of course open for a few hours before kick-off on matchdays. It doesn’t appear as there are any publicly available tours of the Cashpoint Arena. Maybe it’s not as much of a money maker as I originally thought. 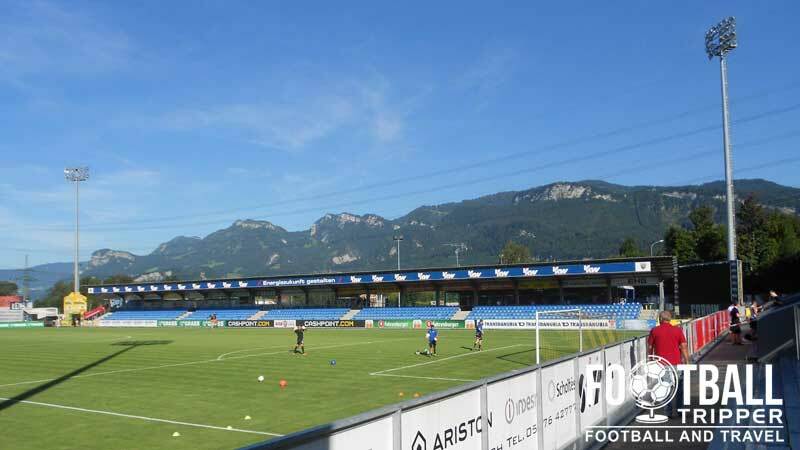 Tickets to see SC Rheindorf Altach play at home can be purchased via the usual channels including online, from the fan shop and at the stadium before kick-off providing the matches haven’t sold out. Please note that ticket prices for the highest profile matches of the season increase by around €2.00 – €4.00 euros in order to offset demand. Stadion Schnabelholz is located within the Rhine Valley approximately 1.5 km west of the town of Altach just beyond the Rheintal Autobahn which marks the inner city’s limits. The distance can be walked in just under 20 minutes by the average Football Tripper which makes the Cashpoint Arena fairly convenient to get to. There is a limited amount of on-site parking available at the ground on matchdays but make sure you get there early to take advantage of it. Altach Railway Station sits slightly further away from Rheindorf Altach’s ground at a distance of 2.2 km, although it’s still highly walkable within 25 minutes. Austria is ridiculous green and full of mountains. Cashpoint Arena is served by its own bus stop which is simply known as “Altach Stadion”. The closest major airport to Altach appears to be St. Gallen-Altenrhein Airport which is 25 km north and overlooks Lake Constance (Bodensee). The closest place to stay to Stadion Schnabelholz is Hotel Hahn GmbH just across the motorway back towards the town centre. Unfortunately the remainder of accommodation options such as Business Hotel 24/7 and Valerian – Das Business Hotel require that you get a taxi or hire a rental car.